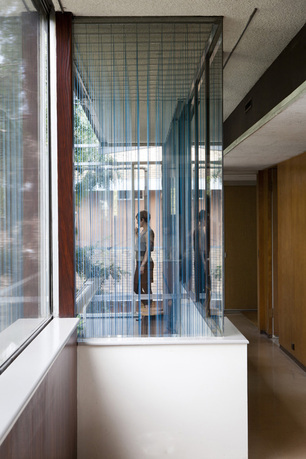 Bryony Roberts, Inverting Neutra, installation view, 2013, Neutra VDL Studio and Residences, Los Angeles. Courtesy of the artist. 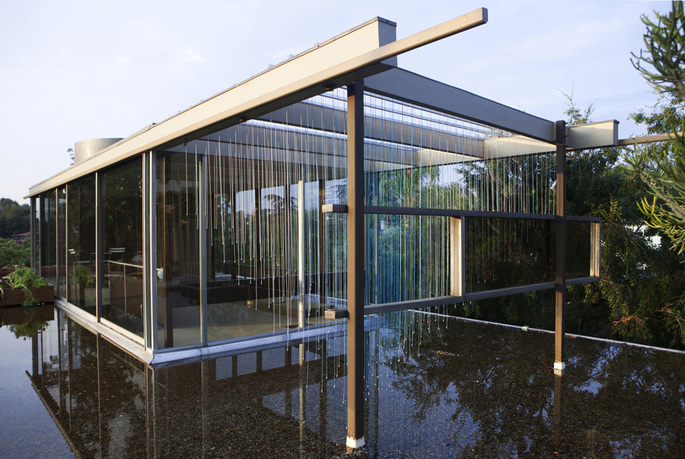 Inverting Neutra is an installation at Richard and Dion Neutra's VDL House II (1932/1966) in Los Angeles that offers spatial inversion as a strategy for activating historic architecture. 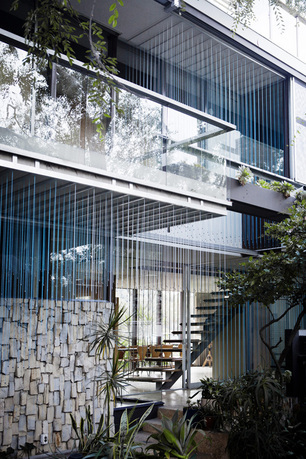 The VDL House is known for its close interlocking of interior and exterior space, in which exterior spaces penetrate the house from the street up to the roof terrace. 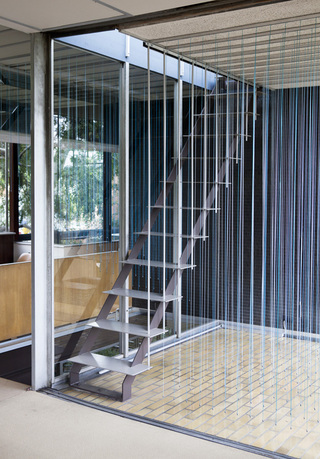 These exterior voids extend out from the central vertical stairs and serve as interruptions to the modular grid of the house, following instead the module of the stair railings. 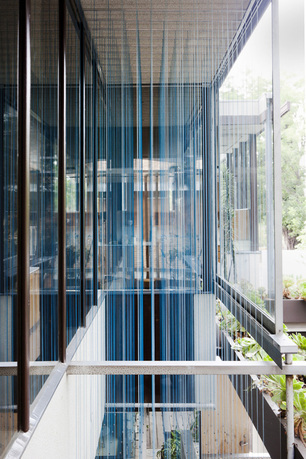 This project performs an inversion by turning the void spaces into distinct colored volumes, filled with hanging blue cords following the spacing of the stair railing module. Turning void into solid, the inversion transforms the voids into a new dominant figure, thereby subverting the existing architecture by extending and enhancing its spatial logic. 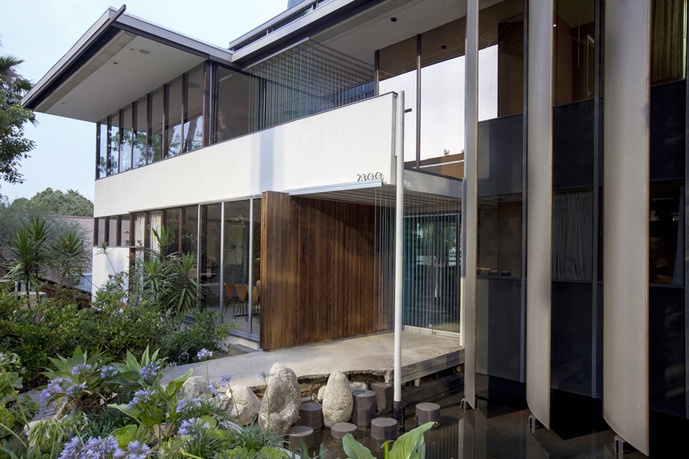 Rather than critiquing Neutra or his architecture, the project serves as a provocation to the schism between architecture and preservation practices, framing preservation as an act of design by constructing an alternative experience of a historic structure. The project hosted a discussion on alternative preservation practices, including Barbara Lamprecht, Kimberli Meyer, Todd Gannon, Dora Epstein Jones, and Sarah Lorenzen. 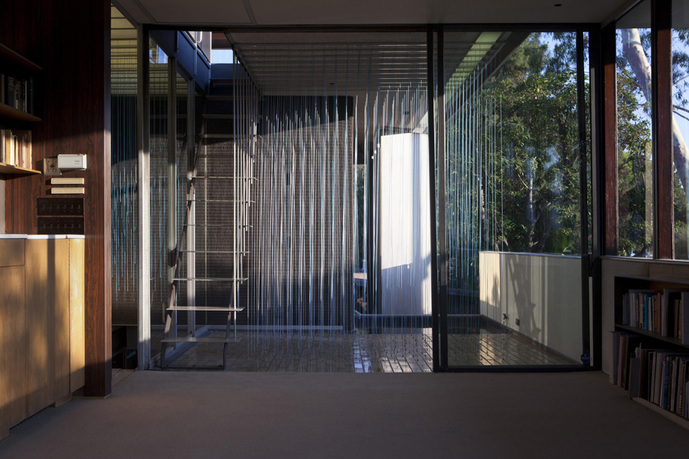 Bryony Roberts is the principal of the design and research practice Bryony Roberts Studio, based in Los Angeles and Oslo. She earned her BA from Yale University in Humanities and Studio Art, and her MArch from the Princeton School of Architecture. After working in the offices of WORKac in New York and Mansilla + Tunon in Madrid, she founded her own design and research practice. 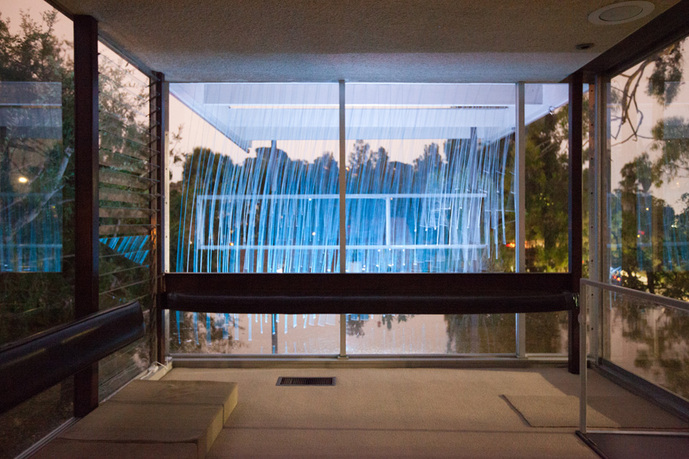 Her practice engages a range of projects from installations to residential to urban design, and was recently featured as one of four emerging practices in LA Forum's Out There Doing It series. Her work has been exhibited in Rome, Berlin, Los Angeles, Houston, and New York, and her writing has been published in Log, Architectural Record, Pidgin, and PLAT journal. She recently guest edited an issue of Log on the theme of New Ancients with Dora Epstein Jones. She was a Wortham Teaching Fellow at the Rice School of Architecture from 2011 through 2013, has taught at SCI-Arc in Los Angeles, and is currently teaching at the Oslo School of Architecture in Norway.